I love working with LaTasha and the LB Innovations Events team. They are timely, pleasant to work with, and always go above-and-beyond the task at hand. I highly recommend this company! LaTasha and the LB Innovations Events team did a spectacular job in designing and coordinating my wedding. LaTasha is very responsive, professional and was able to create an elegant affair with minimal input from me. All I had to do was provide my wedding colors and my likes. LaTasha ran with it and did an outstanding job. I highly recommend LB Innovations Events for designing or coordinating any type of event. Thank you for the amazing job! Everything was beautiful. The set up turned out very nice. Great experience! Latasha is attentive and brings great care to her clients. Thank you for all you did to make our event spectacular. Although I was a tad stressed about our upcoming wedding, I had zero stress associated with the decor or things running smoothly. I knew that we were in very good hands with Mrs. Briscoe of LBInnovations. Everyone raved about how beautiful the reception hall was. She and her team fulfilled all of our requests and more. I would recommend LBInnovations to anyone! Thanks for a job very well done!!! Thank you so very much. It was pleasure working with you! Great vendor and service was awesome! My husband and I are very pleased with her services and will definitely use her services for future events. On the 3rd of December, 2016 the Tri-County Youth Services Bureau in Southern Maryland celebrated its 45th Year Anniversary Gala. LB Innovations Event Coordinator was the event planner for this Celebration. I had the pleasure of working with Ms. Briscoe who, is an expert in her field. She is knowledgeable and resourceful, professional, honest, and most of all, she is warm. Ms. Briscoe has a welcoming spirit, which makes it even more intriguing to have confidence in knowing that you are hiring some who you will have the pleasure of working with to plan your special event. Very accommodating and creative to fit our budget. Thoughtful gift of beautiful wedding topper. I recommend. The owner of LB Innovations, LaTasha told us up front, tell me what you like and don't like and let me create it. Well I went through the stress of trying to create a vision board for my wedding (which took months) instead of taking her advice. In the end, she took the ideas I kind of still had in my head and created our perfect wedding in July 2016. AMAZING and highly recommend! Very accommodating and creative to fit our budget. Thoughtful gift of beautiful wedding cake topper. Planning, flowers, and vendor management, lots of hand-holding of the very un-creative bride. I recommend. Latasha was an excellent coordinator/ planner/ florist. As stressed as I was about the little details of my wedding, Latasha made sure everything turned out beautiful. Thanks again to you and your team for making my wedding everything and more..
LB Innovations did a great job. I recommend establishing a schedule to review progress to include designs arrangements. The onsite services provided were awesome. Ms. Briscoe and her staff were at the ready. 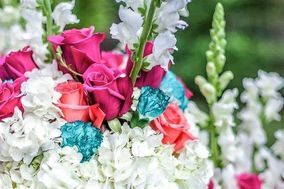 They engaged with other Vendors and alleviated a lot of pressure off of the Bride and other wedding party members who were initially assisting. I'd recommend LB Innovations in the future.